Brick Oven for sale!!! 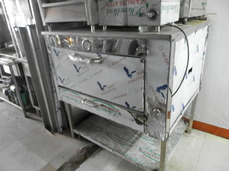 stainless steel body , lpgas operated, with thermostat control, surrounded by bricks inside the cooking area for optimum heat. Good for pizza, cakes and pastries, breads, etc. Dimensions: 34" LENGTH X 17" WIDTH X 24" HEIGHT. We fabricate others sizes and capacities.